Production of the P.1.B continued and with this a further order for twenty developed versions of the Lightnings was placed. These aircraft were designated F MK.1. Not all the F MK.1's M were built with XM148 & XM149 not coming into existence. XM168 became a static test airframe at Warton but never flew. On 29 October 1958 the first Lightning F MK .1, XM134, was rolled out. The aircraft's maiden flight was undertaken by Roly Beamont on 3 November 1958 from Samlesbury. The Certificate Of Airworthiness was granted for the aircraft in December. The next Lightning to fly was XM153 on 14 November 1958. Following a stint at the Central Fighter Establishment, the aircraft was then released for operations on 14 May 1960. No 74 Squadron was the recipient of XM153 on 29 June and thus became the RAF's first Mach 2 squadron. 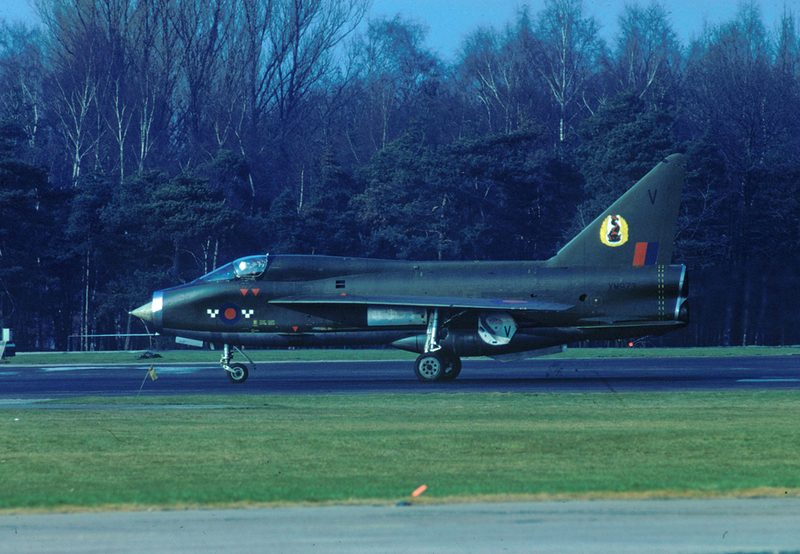 The Lightnings replaced No 74's Hawker Hunter F.6's. Over the coming months more Lightnings came on stream with No 74 Squadron and by January 1961 conversion was complete. No 226 Operational Conversion Unit (OCU) became the only other unit to operate the F.1 and this was formed using six ex 74 Squadron aircraft in July 1963 at RAF Middleton St George. The Lightnings of 226 featured the markings of No 145 Squadron as this was the shadow unit of the OCU. 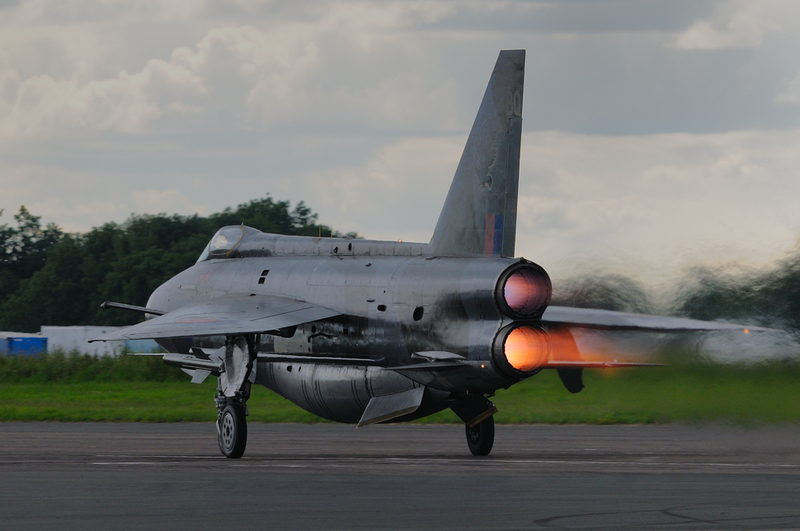 It is well known that the Lightning was not known for its fuel economy and thus lacked range and endurance. So to overcome this, a rather crude refuelling probe was fitted. From MK.1A XM169 onwards, which first flew on 16 August 1960, the probe became a standard fit and twenty eight further examples were built. Power was supplied by two Avon RA24R engines and this Mark featured a cable duct down each side of the aircraft. The ducts were required to remove cables from within the fuselage which were considered a fire risk. XM169 went onto the join No 111 Squadron at RAF Wattisham in October 1964. 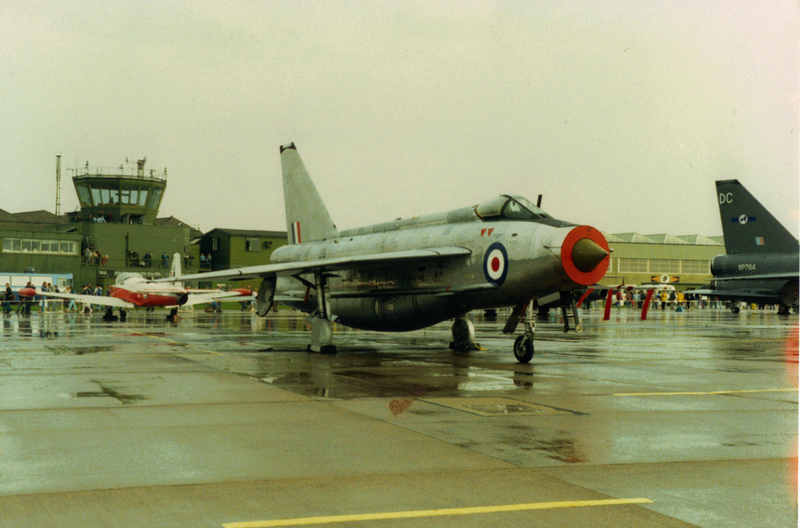 Treble 1 had received its first Lightning F.1A in the form of XM182 in March 1961. On 28 February 1961, No 56 Squadron received its first F.1A, XM171. The unit went on to become the first official RAF aerobatic team when the Firebirds were formed. As with the F.1, F.1As found their way to No 226 OCU which was based at RAF Coltishall from 1964. Other Mk.1 and MK.1As went to AFDS at RAF Binbrook, that went on to become Fighter Command Trials Unit (FCTU) in January 1966. When the FCTU was disbanded in June 1967 the aircraft went to the Binbrook Station Flight. All MK.1 & MK.1As had retired by 1974 having been used for roles which included Target Facility Flights at RAF Wattisham and RAF Leuchars. One was used as a station hack at RAF Leconfield which must have provided some enjoyment to those lucky enough to fly the aircraft. The next model on the scene was the F.2/2A. Forty Four examples were produced but the Mark was not intended to replace the MK.1/1A. Externally the mark looked the same except for a stand by DC generator which was located on the fuselage spine. However, internally the changes were quite complex. Navigational aids were improved and a liquid oxygen system was fitted. The two Avon 210's featured a fully variable reheat system. The design considered the pilot by improving the radar display and an improved instrument layout was provided. The first F.2 to fly was XN723 on 11 July 1961 with Jimmy Dell as pilot. After a spell at Boscombe Down and then Rolls Royce, the aircraft crashed when No 2 Avon caught fire at Hucknall. The crash subsequently delayed the F.2's entry into service. On 14 November 1962 the first F.2 delivered to the RAF was XN771. This went to AFDS at Binbrook after having been test flown by Roly Beamont in the previous August. No 19 Squadron became the first RAF unit to be equipped with the F.2, when XN774 was taken on charge on 17 December 1962. Following on from this, No 92 Squadron received its first F.2 XN727 on 26 March 1963. At the time both No 19 & No 92 were based at Leconfield however, the squadrons subsequently relocated to RAF Germany with No 92 going to Geilenkirchen and No 19 to Gutersloh. Further development of the Lightning envisaged the F.2 being upgraded to the F.3. However, a number of F.2's were converted into F.2A's. This derivative featured a squared enlarged fin, cambered wing, a larger belly tank, and modified Avon engines which bore the designation 211R. In many ways the F.2A looked like an F.6 as it incorporated most of that types features. The first aircraft that was converted was XN795. The final version of the F.2A was reached with XN726. The aircraft retained its AI.23 radar, Firestreak missiles and the nose guns of the F.2. First flight took place with Jimmy Dell at the controls on 28 March 1968 with the aircraft being passed to No 19 Squadron on 7 June. The F.2A was used by No 19 & No 92 Squadron until their replacement by F.4 Phantoms in early 1977. The F.3 progressed Lightning development still further. The aircraft was fitted with an improved AI.23B radar, and uprated Avon 301R engines. Also fitted was the full OR946 integrated flight system along wit De Havilland Red Top missiles. Firestreaks could still be carried but the nose guns were removed. Due to increased thrust and a change in the shape of the missile pylons, the rudder area required an increase in size along with reshaping of the fin. A P.1.B was reworked to become the first F.3. XG310 undertook its first flight as an F.3 on 18 November 1961 with Jimmy Dell as pilot. The first production F.3, XP693 (later converted to an F.6), undertook its first flight on 16 June 1962. 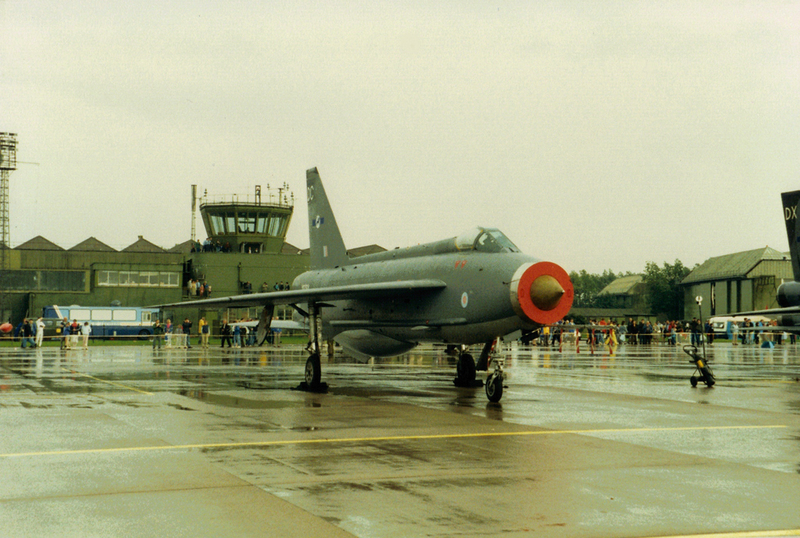 XP700 became the first operational F.3 Lightning on 14 April 1964 when it was delivered to RAF Leuchars. No 74 Squadron flew a mix of F.1s and F.3s until full conversion to the new model took place. Also based at Leuchars at the time was No 23 Squadron who were flying Javelins. 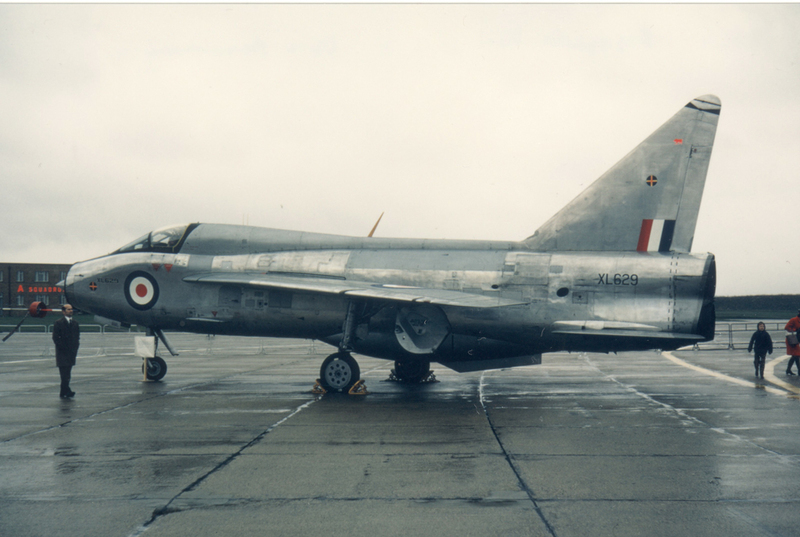 The change over to Lightnings for No 23 began on 19 August 1964 when F.3 XP707 arrived. With production of the F.3 in full swing, the next squadron to equip with Lightnings was No 111. XP741 joined the squadron in December 1964. Next No 56 Squadron took on the F.3 with XR719 arriving on strength in March 1965. No 226 OCU received its first F.3 in June 1970. For many years the USAF were of the opinion that their Lockheed U2s were beyond the reach of contemporary fighter aircraft. This thought was rather rudely challenged during the summer of 1965 when an F.3 of No 111 Squadron, flying from Wattisham, intercepted a high flying U2 from Lakenheath. The Lightning attained a height of 87,500' which must have been a bit of a surprise to the U2 pilot. The new wing was fitted to F.3, XP697, and first flew on 13 August 1963. The tests were successful and all further F.3s on the production line were thus modified. XP697 was further reworked with a refined and bigger area rule ventral tank. This enabled much needed fuel to be carried and crucially, range to be extended. The tank could hold 4,880lb of fuel whilst the forward section could be used to house a pack containing a pair of 30mm Aden cannons, feed mechanisms and ammunition. An arrestor hook was fitted and overwing ferry tanks were added that housed 2,380Ib of fuel. A secondary use for the overwing pylons was the fitting of 2’’ rocket pods. XP697 flew for the first time in F.6 configuration on 17 April 1964 in the hands of Roly Beamont. Fifteen F.3s incorporating F.6 features (with the exception of overwing hardpoints) were built designated F.3 ER/6int. This was a bit of a mouthfull so the aircraft became known as F.3A (Interim). The first aircraft XR752 was flown on 16 June 1965 and delivered to CFE on 26 October of that year and later to No 23 Squadron. Most F.3As went to No 5 Squadron, with XR753 being the first on 16 October 1965. Some F.3A’s from No’s 23 & 5 Squadrons also found their way to No 11 Squadron but most were brought up to full F.6 standard. On 24 November, Roly Beamont tested XR768 at Samlesbury and after FCTU acceptance were completed in March 1966, the aircraft was delivered to No 74 Squadron on 1 August. This was the first true variant of the F.6 Lightning. Deliveries of the F.6 began in early 1967, with No 5 Squadron being the first recipients. The first aircraft that No 5 took on charge was XS894. 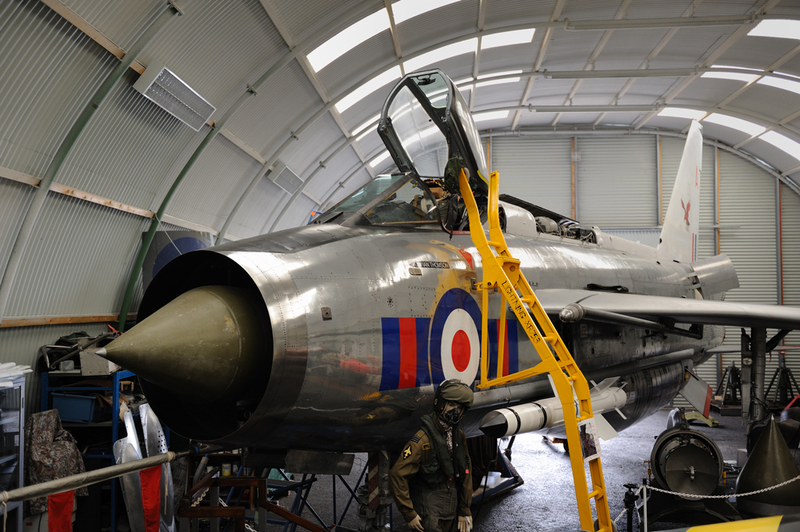 No 74 moved overseas to the Far East on 1 June 1967 where its Lightnings replaced No 64 Squadrons Javelins. No 11 Squadron took over at Leuchars in place of No 74 in May, where together with No 23 they began reforming with F.6’s in exchange for their F.3’s and F.3A’s. 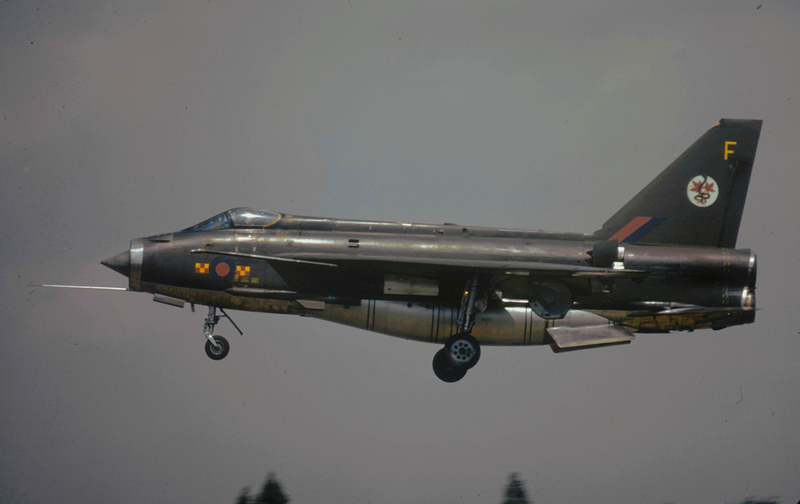 Delivery of XS938 on 28 August 1967 to No 23 marked the last production Lightning for the RAF. The Lightning was a radical change for most pilots over the Hunter and Javelin that were equipping RAF squadrons in the 1960’s. It was obvious that a pilot could not be expected to fly the Lightning with just advice from an instructor standing on the wing and talking over the pilots shoulder. Therefore a training version was required which was to become the T.4. The T.4 featured a side by side seating arrangement which resulted in the aircraft having a bulged appearance around the cockpit. This arrangement was chosen over a tandem arrangement as it meant less design change to existing systems and controls. Effects on the aircrafts performance were minimal through the two seat arrangement, although the cannon armament was removed to allow for the weight of the second ejection seat. An order for twenty aircraft was placed with the first deliveries scheduled for June 1962. XL628 was the first T.4 prototype and was derived from an F.1A. The first flight in the hands of Roly Beamont took place on 6 May 1959. This aircraft was lost over the Irish Sea on 1 October 1959 after forty one hours of flight. It was suspected that the aircraft crashed due to the fin collapsing at high speed. A second prototype, XL629, had joined the two seat development programme in September 1959. On 15 July 1960 the first production T.4, XM966, was flown, with XM970 becoming the first T.4 into RAF service taking place on 2 October 1961. XM970 also went to the Paris Airshow in 1962 for display.The vast majority of T.4's served with the Lightning Conversion Unit (LCU) and 226 OCU. The last T.4's were delivered in January 1963. In all nineteen T.4's were built along with the two prototypes. The Lightning T.5 was based on the F.3 and was powered by twin Avon 301R's which could propel the aircraft to over Mach 2 at 36,000'. The first T.5, XM967, was initially a T.4 which was taken from the production line and transported to Filton. Bristols had been contracted to manufacture the forward fuselages of the T.5. The first T.5, XM567, flew on 3 March 1962 with Jimmy Dell as pilot. Twenty two more T.5's were built the first being delivered to 226 OCU at Coltishall in April 1965. In all 278 Lightnings were delivered to the RAF the last by August 1967. 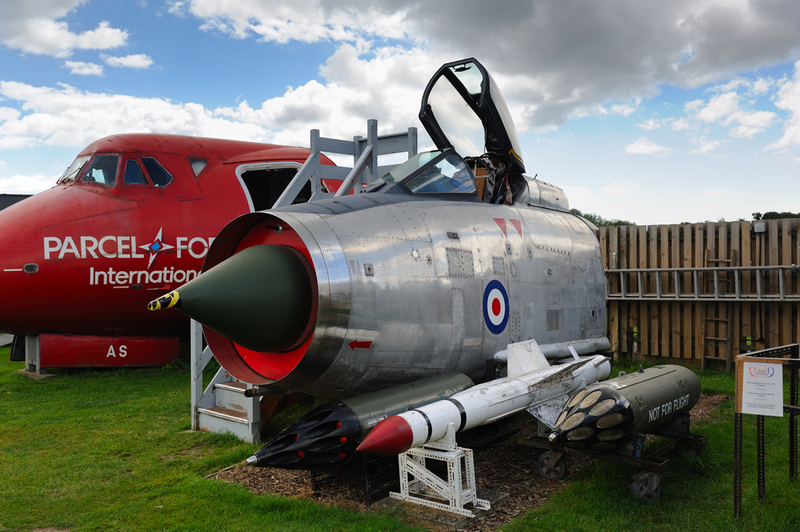 The Lightning saw active service through the 1970s but was eventually replaced by the Phantom. By 1975 only two squadrons had Lightnings on strength, these being No 5 & No 11. The two Squadrons flew a mix of F.3s, F.6s and twin seat T.5s. The disbandment of the Lightning Training Flight in April 1987 sealed the fate of the F.3 in RAF service but a couple were retained for display purposes. No 5 Squadron officially disbanded on 31 December 1987, with their last sortie being flown on 10 December 1987. This left No 11 Squadron as the sole operator of the Lightning with their disbandment coming on 30 April 1988. The last flight of a Lightning in RAF service was undertaken by Squadron Leader John Alderton, former OC of "B" Flight, 11 Squadron. The Lightning was replaced by Panavia Tornado F.3 ADV aircraft which were in turn retired in 2011 with the introduction of the Eurofighter Typhoon. Retirement from RAF service did not see the end of the Lightning in UK skies. 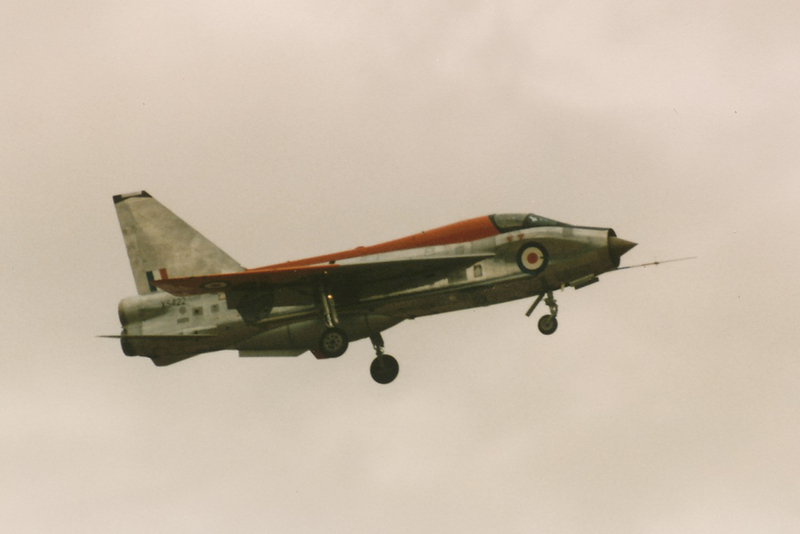 A reprieve was granted for a small number of airframes and these were used in connection with trials for the AI.24 Foxhunter radar that was being developed for the Tornado F.3. British Aerospace (BAe) required aircraft that could be used as targets for Foxhunter trials, the company already had one Lightning on its books, F.6 XP693 and as RAF operations wound down, four more Lightnings were transferred from Binbrook to Warton. One of the Lightnings was subsequently replaced by a further example. The Lightnings were flown for a number of years in connection with the trials giving enthusiasts a last chance to see the aircraft in the air. When the Foxhunter contract came to an end on 17 December 1992 two Lightnings were flown to Exeter airfield in Devon for delivery to the Lightning Flying Club. The club's aim was to keep a Lightning flying in UK skies but hostility from the Civil Aviation Authority prevented this from ever happening. 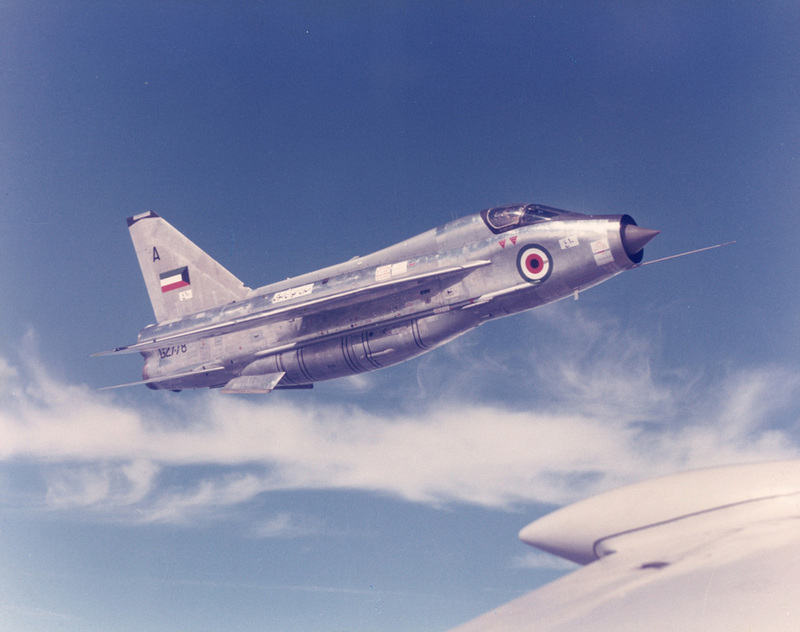 On 4 July 1964 Jimmy Dell displayed Lightning F.2, XN730, to the King of Saudi Arabia. From that moment on the Saudi’s were very keen to procure the Lightning for its own air force. The Saudi’s sent one of their own pilots, Lt Hamdan, over to Warton to fly the Lightning and he was let loose in F.2, XN723, following some dual on a T.4. Flying in chase was an RAF F.3 who watched the enthusiastic Saudi put the F.2 through its paces. Lt Hamdan was suitably impressed and an order for forty Lightnings was placed by the Royal Saudi Air Force (RSAF). This stage of supplying the RSAF was code named Operation Magic Palm. This entailed the delivery of six Lightnings, six Hunters and a battery of Thunderbird surface to air missiles. The Lightnings were drawn from four ex RAF F.2s and two T.4s. The aircraft were refurbished at Warton and were designated F.52 & F.54. The first Lightnings delivered to the RSAF were two F.54s, 54-650 (XM989) and 54-651 (XN992) with Jimmy Dell and Don Knight as pilots respectively. 54-651 arrived in the Saudi Kingdom later in June 1966 with 54-650 finally reaching its destination on 28 July 1966 having encountered some problems on the way. By this time the four F.52's had also arrived without incident. One of the reason the Saudi's wanted the Lightning was to make it clear to some of their foes, these being the Egyptians (who insisting on overflying the Kingdom) and insurgents on the Yemen border, that they would not stand for any nonsense when it came to defending the Kingdom. 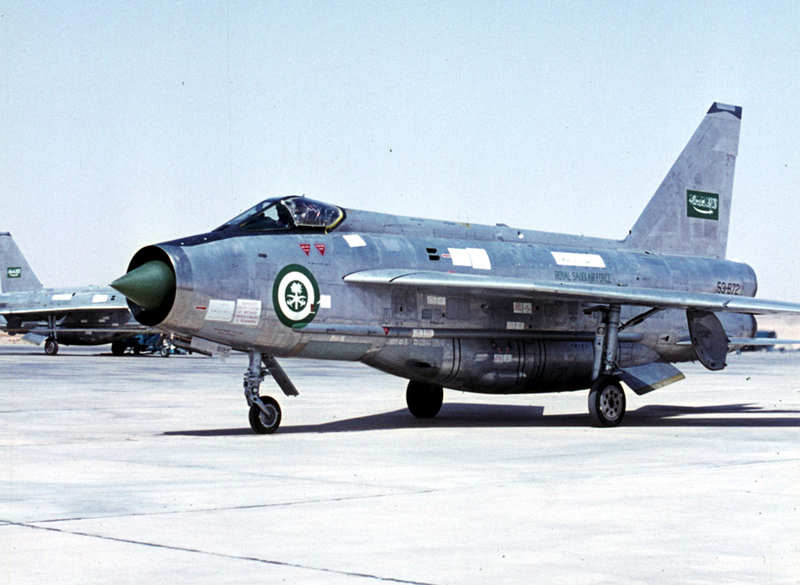 The Lightnings often carried out demonstration flights at Riyadh and it was during one of these that the first one was lost. F.52 52-657 appeared to stall on take off and was written off. Luckily the pilot, Peter Hay, survived having ejected albeit with spinal injuries. Another replacement F.52 was sent in the form of 52-659. On 19 October 1966 the first F.53 took to the air in the form of 53-666. The F.53 was effectively a ground attack version of the F.6 and carried more than just air to air missiles. Hardpoints above and below the wing of the F.53 allowed it to carry a variety of stores. Those below allowed Matra 155 SNEB 68mm rocket pods to be carried. The over wing pylons could carry JL100 Pods which contained an 18-round SNEB rocket launcher in front and a 50 Imperial gallon fuel tank in the back. The pylons could also carry a pair of 1000Ib bombs and a parachute retarded version could be fitted to the over wing pylons. The Red Top missiles could be replaced with a Microcell unguided rocket pack or a day a night reconnaissance tray. 30mm Aden cannons could also be fitted to the front of the ventral tank. Six T.55 were also ordered which were equally or more capable as the F.53's, being due to having a second crew member who could act as a weapons operator. The first T.55, 55-710, flew from Warton in October 1966. Training of RSAF pilots took place at RAF Coltishall under the auspices of 226 OCU. The T.55s arrived at Coltishall in September 1967 with the last ones departing in 1969. By mid 1969 the RSAF had three operational Lightning squadrons, these being 2, 6 & 13. Problems with Yemen continued into 1970 and just before peace was declared an RSAF Lightning, F.53 53-697, was hit by ground fire close to the Yemeni border. This was the only RSAF Lightning loss on operations. In January 1986 the Lightning was withdrawn from RSAF service. The RSAF struck a deal with BAe for a replacement aircraft type and part of the deal was a return to the UK of the Lightnings. The jets were ferried back to the UK in the hope they could be refurbished and sold on to Denmark or Austria, however, this fell through. The Lightnings were then offered to museums or other interested parties. 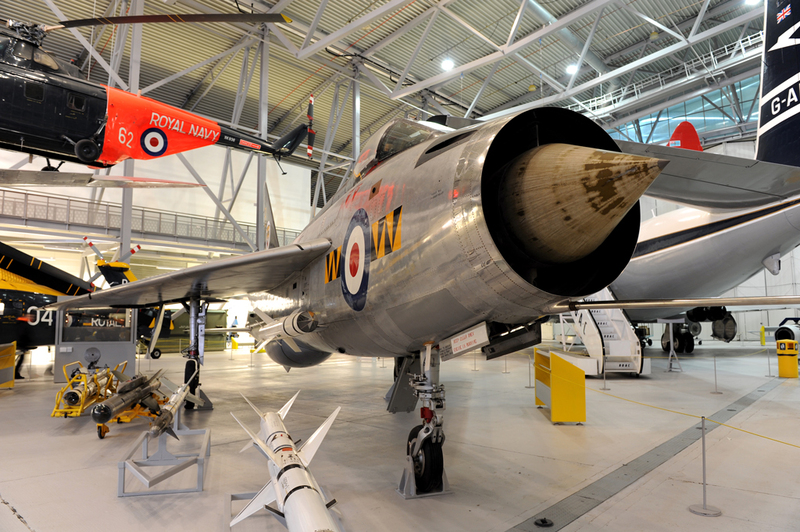 Another Lightning F.53 that found its way back to the UK was ZF578 (53-670). The aircraft now resides at Tangmere Military Aviation Museum in the guise of XR753 of No 23 Squadron. The Kuwaiti Air Force (KAF) ordered fourteen Lightnings, twelve F.53Ks and two F.55Ks. There were difficulties keeping this small force in the air and in 1973 the aircraft were offered for sale. There was little interest, however, the KAF kept the Lightnings flying until 1977. They were all then grounded and replaced by the Mirage F.1K. Although not achieving big sales as an export, the Lightning did achieve good results in the Middle East and could be considered as a success in that field of operation.